By Yuu Miyazaki and okiura. Released in Japan by Media Factory. Released in North America by Yen On. Translated by Haydn Trowell. I did give Saya credit for confessing last time, but it’s hard to take “you don’t have to answer me right away” as anything more than backing away at the last minute. That said, that’s more on the author than on Saya herself, and she’s right that she doesn’t want to affect the Gryps team while they’re still competing. Julis and Kirin are both providing what little humor is in this volume with their reactions, which are pretty much exactly what you’d expect. Additional lightness is provided by Laetitia, Claudia’s childhood friend and “rival”, the sort of rival that you always see in these sorts of things, who is constantly talking about defeating Claudia one day but in reality is caring and worried. 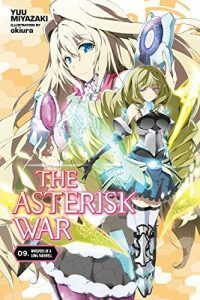 Just because I really enjoy each new volume of Asterisk War does not mean it isn’t hitting each cliche with perfect precision. The bulk of the book stems from Claudia’s somewhat open declaration of war last book, and the Powers That Be deciding that things are so dangerous now that assassinating her in a very obvious way is actually the lesser of two evils. Fortunately, she’s clever and able to avoid getting killed right up till Ayato can show up. Unfortunately, Ayato is related to her REAL wish, and to his horror, it’s a bit of a death wish. As I said before, given what Claudia endures is using her Orga Lux, it’s unsurprising that she’s gotten somewhat jaded and tired – she’s seen being killed by the entire cast, including Julis, Kirin AND Saya. But not Ayato, and this leads to the second confession of the book. I’ll be honest, I did briefly wonder if the author had the stones to kill Claudia off. But honestly, having her survive was not only the more cliched (and thus Asterisk War) option, but it allows for a really lovely it where Ayato asks what she plans to do now, and she literally has no idea – she hadn’t imagined surviving. I’m not sure how her newly “repaired” relationship with her mother and the rest of the PtB will go, but I do know that the next book will have the next tournament bout, and it’s not good news for our heroes – Claudia and Ayato are very depleted on resources. Are they really going to lose? OK, probably not. But Asterisk War remains good frothy fun, with some really good character development this time around as well.